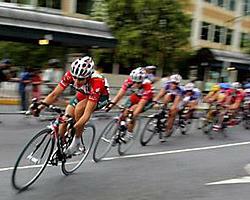 Being a professional cyclist takes tremendous discipline, support, and determination. You have to know how to suffer and actually like it; well at least appreciate the pain. One of the hardest aspects to this lifestyle for me is balance. I race professionally, I'm a wife, and I'm a mother. Ironically, being a mother also takes tremendous discipline, support, and determination. There are many of us racers that are married, but not too many that have children. Those of us with children have a secret bonding in the hostile peleton. We don't help each other race out there, but there is an immediate respect. The balance is a very difficult one. Time management is the key to getting in my training. I get the training in when my five year-old daughter, Madeline, is at school, camp, or with friends and family. I don't have the luxury to go out when the weather is at its best in the day. I go when I can. Usually the training gets in even if it's on the trainer before dusk; it's the recovery and rest that get bumped out of my busy schedule. I'm never "off my feet" or taking naps. That just doesn't happen. Planning my race schedule involves many moving parts. Bill (my husband) and I basically make a flowchart to illustrate where my daughter will be at all times of the day when I'm away and Bill's at work. This illustrates who will pick her up and where they will drop her off. It also has two back-up plans in case plan A falls apart. I pack all my bags and then all of Madeline's bags. We rely heavily on family and friends while I'm away. I write notes to her teachers and coaches to let them know that I'm away and to give her extra hugs if she's having a bad day. But usually Bill spoils her like crazy when I'm traveling. Sometimes I question my decision to race on this level and wonder if it's affecting Madleine in a negative way. This especially happens after a crash or bad day on the bike. This is exactly when Bill steps in and reassures me that I'm doing the right thing for myself and especially for Madeline. Madeline sees her mother as an athlete that is strong and determined; a mother that can do anything if she puts her mind to it. How many mothers can give that gift to their child? The gift of confidence and strength, endurance and toughness. We often see that role in the father or male figure in the household. In this case, she gets that from both of us. Madeline travels with me sometimes, too. She has met so many tremendous people through my racing. She has friendships and "pen pals" that will last a lifetime. She even has a crush on a certain Colavita mechanic that happens to think she's a pretty neat kid as well. She enjoys the traveling circus and will probably make a great Director Sportif someday if she wants to. I know that this lifestyle does not suit all, but it's our lifestyle right now. It's one that takes courage and commitment. It's a balance, but I have it all!! !